In a recent post about the homing behaviour of pigeons, I discussed the hypothetical structure of magnetoreceptors. Although these receptors have been hypothesized, researchers have so far failed to identify them unambiguously. Gerta Fleissner and her colleagues at the University of Frankfurt in Germany have identified putative magnetoreceptors in homing pigeons. Using histological methods, electron microscopy and X-ray analysis, they visualized the distribution of magnetic iron mineral crystals in the beaks of homing pigeons, and examined their subcellular arrangement. The findings are published in the journal Naturewissenschaften. Fleissner’s group found that the crystals are located in the unmeylinated dendrite-like processes of sensory neurons in the trigeminal nerve, which project to six patches of skin lining the inner surface of the pigeon’s upper beak. Each patch is approximately 350 µm long and 200 µm wide, and contains loose concentrations of crystals organized in linear or slightly curved assemblies. The system is bilaterally symmetrical, with three of these skin patches on each side of the beak. X-ray image of the upper beak showing the six areas of skin containing iron crystals and the orientation of each. The nerve cell processes in each patch are also arranged in highly organised three-dimensional patterns: they are aligned in parallel along their longitudinal axes, with a uniform distance of about 100 µm (micrometres, thousandths of a millimetre) separating them. In each patch, the processes are oriented in a specific direction: those in the patch of skin nearest the eyes are aligned in a caudal-to-rostral (or tail-to-head) direction, those in the medial region of the beak are arranged in a middle-to-side direction, and those in the patch near the tip of the beak are arranged in a top-to-bottom direction. Each pair could, therefore, detect the one of the three axes of a magnetic field vector. Iron crystal deposits in dendrite-like processes of the skin in the upper beak. The processes contain two different types of iron mineral – magnetite and maghetite, organized in three subcellular compartments. The magnetite, of which about 10% of the crystals are composed, occurs as 2-4 nanometre-sized particles which are accumulated in spherical clusters of about 1 µm in diameter. These clusters are adhered to the inner surface of the cell membrane and are embedded within an organic matrix whose composition is as yet unknown. 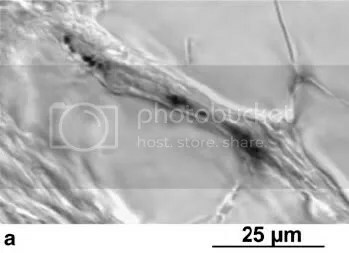 By contrast, the maghetite crystals are found as an irregular crust on the surface of vesicle-like structures, or in flat, square platelets that form approximately 10 µm-long chains along the length of the processes. The authors estimate that the homing pigeon’s beak contains about 85 nanograms of iron. The mechanism by which this system transduces magnetic signals remains unclear however, although the authors suggest that the structures they have identified could detect both the strength and orientation of the geomagnetic field. They speculate that the maghetite crystals around the vesicle-like structures may be involved in amplifying the intensity of a local magnetic field. This would account for the high degree of sensitivity required by a magnetoreceptor. Because they have found iron oxide crystals in the beaks of robins, golden warblers and chickens, the authors also suggest that this system may be a universal found in all birds.